Thank you Shannon Houghton for the awesome meme picture! Check out Shannon’s fabulous blog! A Tangle of Knots by Lisa Graff, May B. by Caroline Starr Rose and Walk Two Moons by Sharon Creech all go well with Dark Chocolate Peanut Butter Cups from Trader Joe’s. Question: What book doesn’t go well with dark chocolate peanut butter cups? I can’t think of one either. A huge thank-you to my Twitter friend Nicole @BlueSockGirl for the yummy peanut butter cups! I love spring break! I get to sleep in! I’m able to spend time with my family! And last but not least…..I have TIME to READ!!! I love all 3 of the books in my Treat Tuesday picture this week. So my post today is 3 times as sweet! You must check out Tangle of Knots by Lisa Graff. If you love cakes, mysterious characters and TALENTED people then this book is for YOU! I so wish I loved to bake because the cake recipes inserted throughout this book sound scrumptious! I was already a fan of the author Lisa Graff after reading Umbrella Summer. So I urge you to read her beautiful books. Learn more about Lisa Graff and her awesome books on her blog! 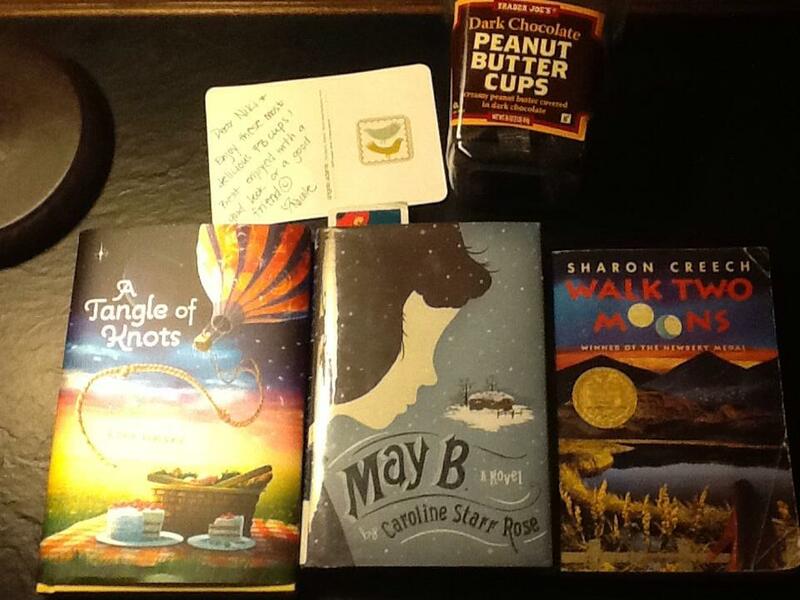 I am so glad I read May B. by Caroline Starr Rose for the Sharp-Schu book club! What an amazing book for poetry month! If you love Hattie Big Sky by Kirby Larson and Hatchet by Gary Paulsen then you will love May B. I was excited to read May B. after reading the beautiful poem that Caroline Starr Rose wrote in honor of the book Love That Dog by Sharon Creech. And speaking of Sharon Creech ……I have been listening to the audio for the Newbery winning book Walk Two Moons. I adore this audio book! I would say that Walk Two Moons is fast becoming one of my favorite audio books as well as one of my all time favorite books ever! Huzza! Huzza! 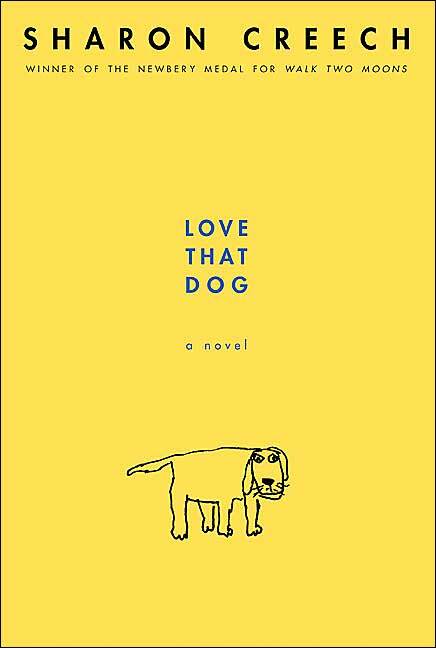 I also highly recommend Love That Dog and Hate That Cat for poetry month. Your students will love these books and they will inspire them to write poetry of their own. Learn more about Sharon Creech and her fantastic books here! So what did you read over spring break? Have you read any of the books I listed in my post? What did you think? I look forward to hearing your thoughts in the comments section. 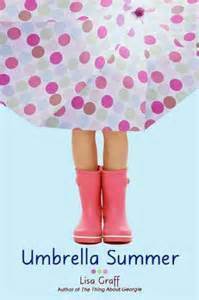 This entry was posted in Treat Tuesday and tagged A Tangle of Knots, Caroline Starr Rose, Lisa Graff, Love That Dog, May B., Sharon Creech, Sharp-Schu Book Club, Treat Tuesday, Umbrella Summer, Walk Two Moons. Bookmark the permalink. 2 Responses to It’s Treat Tuesday! Spring Break=Reading Bliss! My daughter would love the “cake” book. & I can’t wait til we get our Trader Joe’s. I am so jealous you are getting a Trader Joe’s. I don’t know if we will ever get one in Kalamazoo. I hope your daughter gets a chance to read A Tangle of Knots. 🙂 If she does….let me know what she thinks.